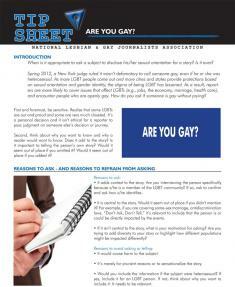 “Are You Gay?” is the latest NLGJA tip sheet on LGBT coverage. When is it appropriate to ask a subject to disclose his/her sexual orientation for a story? Is it ever? Spring 2012, a New York judge ruled it wasn’t defamatory to call someone gay, even if he or she was heterosexual. As more LGBT people come out and more cities and states provide protections based on sexual orientation and gender identity, the stigma of being LGBT has lessened. As a result, reporters are more likely to cover issues that affect LGBTs (e.g., jobs, the economy, marriage, health care), and encounter people who are openly gay. How do you ask if someone is gay without prying? First and foremost, be sensitive. Realize that some LGBTs are out and proud and some are very much closeted. It’s a personal decision and it isn’t ethical for a reporter to pass judgment on someone else’s decision or journey. Second, think about why you want to know and why a reader would want to know. Does it add to the story? Is it important to telling the person’s own story? Would it seem out of place if you omitted it? Would it seem out of place if you added it? To read the complete tip sheet and download a PDF, click here.